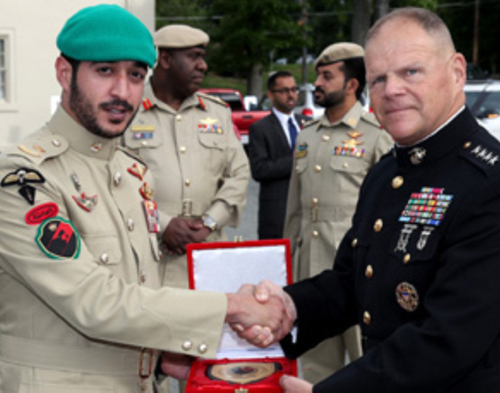 Commander of the Royal Guard Special Force Major His Highness Sheikh Khalid bin Hamad Al-Khalifa met Commandant of the Marine Corps General Robert B. Neller at the US Marine Corps University in Quantico, Washington, Bahrain News Agency (BNA) reported. The meeting was on the sidelines of the graduation of Sheikh Khalid bin Hamad Al-Khalifa, who completed a joint command and staff course at the Marine Corps University. He conveyed greetings from His Majesty King Hamad bin Isa Al-Khalifa, the Supreme Commander, Bahrain Defense Force (BDF) Commander-in-Chief Field Marshal Sheikh Khalifa bin Ahmed Al-Khalifa and Royal Guard Commander Brigadier HH Highness Sheikh Nasser bin Hamad Al-Khalifa. Sheikh Khalid bin Hamad Al-Khalifa reviewed with Gen. Neller strong bilateral relations and defense cooperation between the BDF and the US Army. The two sides discussed ways of bolstering cooperation between the US Marines and the Royal Guard Special Force to develop officers and servicemen’s competences and combat readiness. Sheikh Khalid bin Hamad Al-Khalifa exchanged commemorative shields with Gen. Neller, who hailed strong bilateral relations and growing military cooperation. The meeting was attended by Bahrain’s Ambassador to the United States of America Sheikh Abdulla bin Mohammed Al-Khalifa.